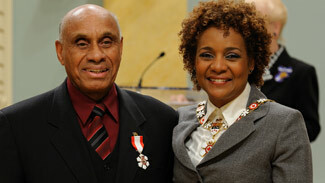 Willie O'Ree, the first black player in NHL history and the longtime Director of Youth Hockey Development for NHL Diversity and the Hockey Is For Everyone Initiative, received the Order of Canada in an investiture ceremony at Rideau Hall in Ottawa on Wednesday morning. 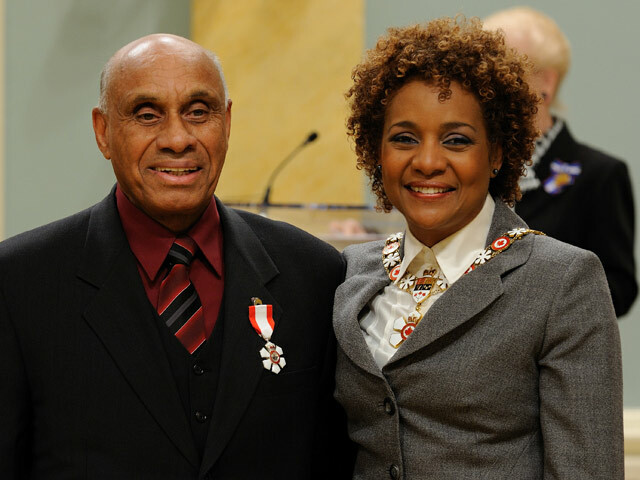 Her Excellency the Right Honorable Michaëlle Jean, Governor General of Canada, presided over the ceremony, at which she bestowed the honor upon 43 recipients. "At the heart of all the storms weathering humanity and all the uncertainty bombarding the world, there are women and men reviving hope," Jean said. "The people we are celebrating today are of that same caliber." O'Ree was invested as a Member of the Order of Canada for his years of service to youth development and the growth of hockey across communities in Canada and the U.S.
O'Ree joined 57 other former NHL players, administrators and supporters of hockey who have received the honor, including Wayne Gretzky, Gordie Howe, Bobby Hull, Jean Beliveau, Lord Stanley and Lord Byng. He also joined his longtime friend, Herb Carnegie, as the only black professional hockey players to receive the Order of Canada. They join Claude Petit, the legendary aboriginal-hockey and veterans activist, as hockey-affiliated minorities to be so honored. "So many wonderful things have happened to me since I started with the diversity program 12 years ago. If I hadn't come aboard a lot of these things would not have happened. It's a nice feeling to know that working with the diversity program and being involved with the kids and all the people I've come in contact with over the years -- (it) makes me feel very deserving." O'Ree said the Order of Canada is the greatest honor his country can bestow and that he had a simple, understandable response when notified last year. "I was overwhelmed," O'Ree said. "I don't know how my name came up, whether I was nominated by an individual or a group. I was at a loss for words. What an honor. "I started getting phone calls right away. NHL Commissioner (Gary) Bettman called me first and then the calls came from all over. "I'm honored. I feel really good that they thought enough of me to honor me with this with award." O'Ree became the first black player in the NHL when he was called up from the Quebec Aces to the Boston Bruins on Jan. 18, 1958, to play against the Montreal Canadiens at the Montreal Forum. The slick-skating O'Ree played only two games that season but was recalled by the Bruins during the 1960-61 season. He played in 43 games that season, posting 4 goals and 10 assists. He was traded to the Canadiens during the summer of 1961 but never played for the NHL team. He was traded a couple of months later to the Los Angeles Blades of the Western Hockey League. He played 15 seasons of professional hockey on the West Coast, returning East for only 50 games with the AHL New Haven Nighthawks in 1972-73. O'Ree was a popular and successful player on the West Coast after his coach, Alf Pike, figured O'Ree was keeping secret the fact that he had been blinded in one eye by a deflected puck several years earlier, before his stints in the NHL. Pike switched O'Ree to his off-wing, right wing, and O'Ree blossomed into a top WHL scorer. O'Ree retired from hockey in 1979 and was working as security director at San Diego's famed Coronado Hotel when he was asked by Bettman in 1998 to head the youth-hockey development program. Since then, he has made hundreds of appearances and conducted hundreds of hockey-instruction clinics. Those clinics are anything but ceremonial, as O'Ree is a coach who pushes kids and makes them reach for their best effort. "I was in Buffalo recently for the Willie O'Ree Skills Weekend," he said. "It was a great weekend of hockey with 48 boys and girls from the United States and Canada. The kids knew about the Order of Canada honor and were congratulating me, along with the directors from the various diversity programs. It just made me feel really good.